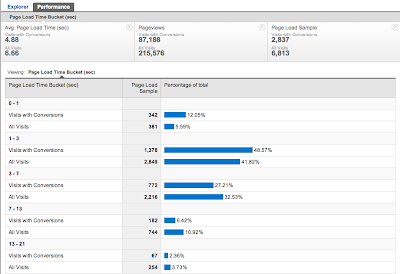 highlighting the new Google Analytics. The new version of Google Analytics is currently available in beta to all Analytics users. And follow Google Analytics on Twitter for the latest updates. This week, we share an update to the Site Speed report to help you better understand your site's performance. In May, we made it easier to compare your site’s business performance with your site’s actual performance with the introduction of the Site Speed report in the new version of Google Analytics. Today we want to share an update. We’ve heard the need to get into more detail about the reporting of your page load times. We’ve introduced a new performance tab in the SIte Speed report that will allow you to see a breakdown of the samples. This allows you to move beyond the averages and better understand your site’s performance. 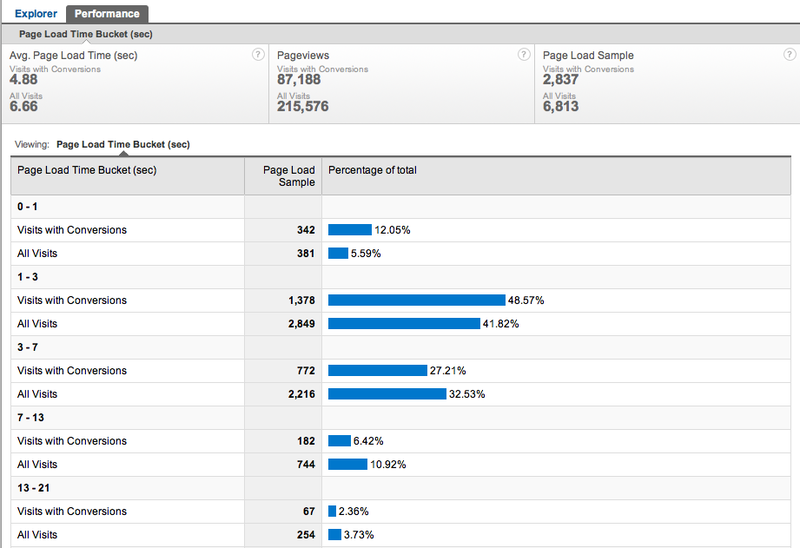 For example, I’m looking at the Site Speed report for the Google Analytics blog. I can see that my average page load time is 7 seconds (we have some room to improve here). Now, we know that averages can hide what’s happening underneath the surface. With the Performance tab in the Site Speed report, I can now dig in and find those details. Ah ha! I can now see that, almost half of my visitors (46%) are actually seeing decent load times of under 3 seconds. And another 32% are getting the page in under 7 seconds. But there’s definitely still room to improve with a full 20% seeing 7+ second load times. Taking this a step further, I can apply an advanced segment, in this case Visits with Conversions. I have set up the blog with engagement goals. So I’m trying to see if there’s a relationship between page load time and engaging with the content here. And looking at this data, it looks like there is. The distribution of visits with conversions is skewed towards fast-loading pages. As page load time increases, I am seeing a drop in conversions. I can actually see the business impact of a slow loading page. Another type of segmentation to try would be by geography. To start off, try segmenting visits from your country versus visits not from your country. From there you may want to dig into specific countries and look at page load times. 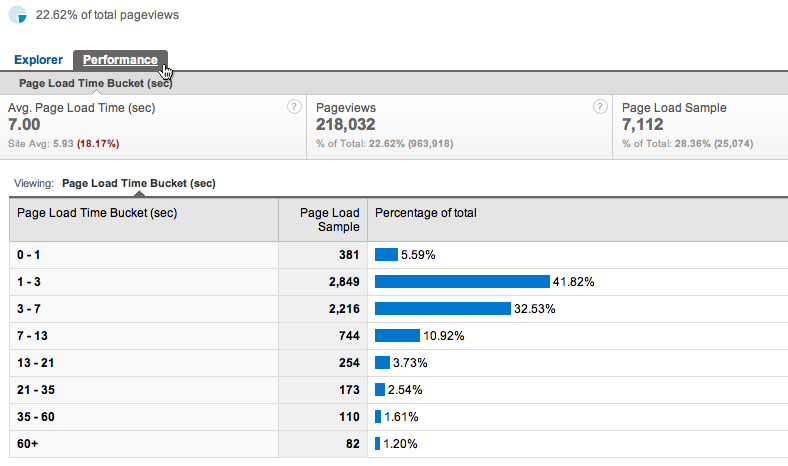 You'll find the Site Speed report in the Content section of the new Google Analytics. To get site speed data, you need to make a small change to your Google Analytics tracking code. Setup instructions and more details about the Site Speed report are in the Help Center. We hope you enjoy the new Performance tab, and you can expect more updates for Site Speed coming soon. 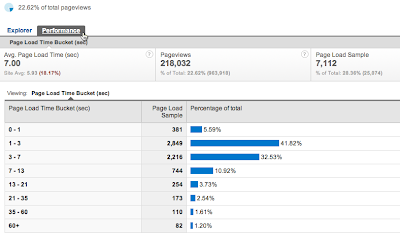 This is part of our series of posts highlighting the new Google Analytics. The new version of Google Analytics is currently available in beta to all Analytics users. And follow Google Analytics on Twitter for the latest updates. This week, we share an update to the Site Speed report to help you better understand your site's performance.